Looking for a PDC in Colorado? This one is shaping up nicely. Awesome instructors with loads of experience with all sorts of specialty areas. I had a wonderful time talking with them, and hope to have them on for solo interviews in the future. http://rockiesedge.com/ – PDC – Elevate your awareness. http://www.earthguardians.org/ – We are committed to standing up to protect the Earth, Water, Air and Atmosphere so our generation, and those to follow, inherit a healthy, just and sustainable planet. We are focusing on weaving together the synergy of individual grassroots youth driven projects around the globe, to create one international, intergenerational movement for effective change. This entry was posted in Podcast and tagged Colorado, PDC on March 18, 2015 by permaculturesalad. Jason Gerhardt – Episode 5 – Water, Fire and Education. Today on the show we have Jason Gerhardt, a permaculture designer and teacher currently based out of Naropa University in Boulder, CO. The show released on June 28th 2013. The interview was recorded on June 25th at Naropa University. Here is a short biography of Jason from the Naropa website. Jason Gerhardt has been applying permaculture design in diverse bioregions from the deserts of Arizona to the fresh water lakes of New York since 2005. Jason holds a BA in Sustainable Design as well as a Diploma in the fields of Permaculture Design and Education. As an emerging voice of permaculture in the U.S, he is known for extensive knowledge of plant ecology, rainwater harvesting, agricultural biodiversity preservation, and integrated ecological design. Jason’s background includes the development of a bioregional seed business, creating sustainable food production systems, and working with community groups to apply permaculture principles on a range of scales from community gardens to conservation organizations. 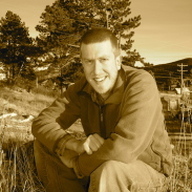 Jason currently teaches a permaculture certificate program for Naropa University and instructs at numerous workshops, courses, and conferences throughout the US. He has taught for many well-respected organizations including Denver Botanic Gardens, Prescott College, Permaculture Institute USA, and the U.S EPA. Jason practices ecological design professionally through Real Earth Design on scales ranging from 40 acres to small city yards. This entry was posted in Podcast and tagged Boulder, Colorado, fire strategy, Naropa, permaculture education, Water harvesting on June 28, 2013 by permaculturesalad. Scott Pittman – Episode 9 – Permaculture History and Standards | A Permaculture Resource Site on Jason Gerhardt – Episode 5 – Water, Fire and Education. permaculture Scott Pittman Interview | Permaculture Blog on Jason Gerhardt – Episode 5 – Water, Fire and Education.